You can always tell when summer is on its way due to the smell of burnt barbeque offerings wafting through the weak and hazy sunshine air. And Bill's barbeques are no exception. He specialises in well-done sausages and burgers that would make ideal frisbees. He can never work out why all the food ends up so over cooked - its a mystery! 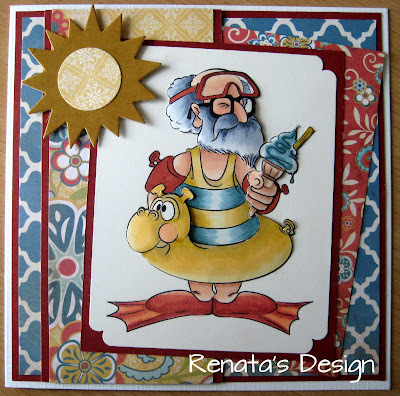 For more details on the card, pop over to my blog! 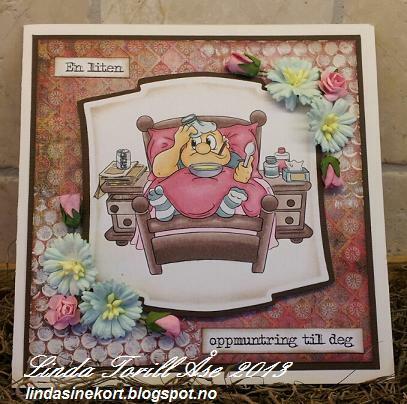 be posting the ocasional card and this is her first. 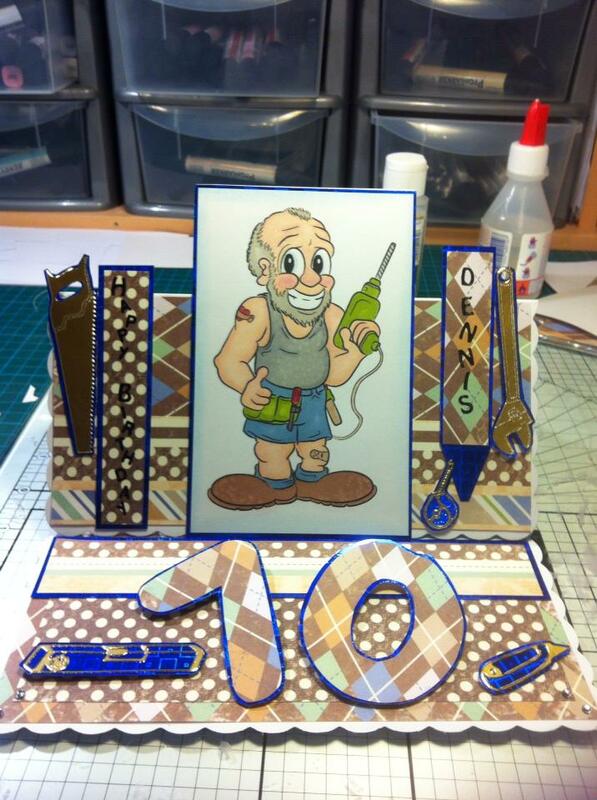 a lovely working of Anglin' Andy. that. Here's our first Dr. Digi colouring Vid..So have a look at how to colour Andy in action. Looks can be deceiving especially when it comes to Dr. Digi's House of Stamps' odd couple, Svetlana and Cyril! They met as struggling actors who would appear in public with proper makeup and costumes to rehearse for upcoming parts! 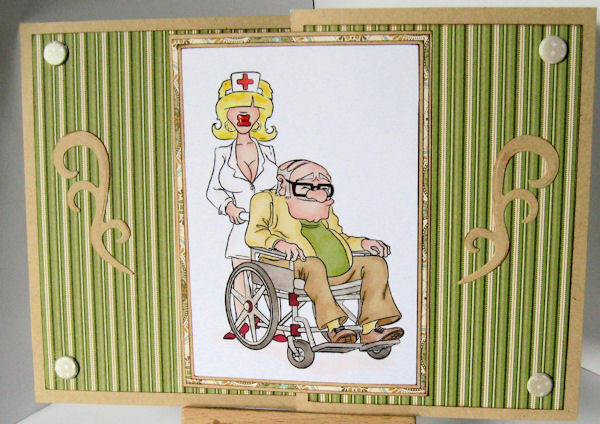 They were so convincing, Cyril would get senior citizen discounts and Svetlana, as his nurse, received free food and admittance to various functions and amusements. With all the savings, they live comfortably in a lavish home unbeknownst to their friends and neighbors that their real occupation is that of con-artist! Cyril was thinking that man flu was a good excuse for spending some time in bed. His wife, being the canny sort, decided that Svetlana was the answer. She didn't mind that Cyril would have someone lovely to gaze upon, every old man needs the occasional treat, but Svetlana, being of Russian extraction, was never going to be a push over. Cyril was out of that bed in a jiffy, Svetlana was awesome with her syringe threats, and he was soon on the road to recovery. 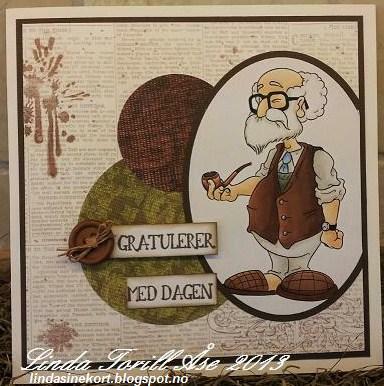 not only do you get a fab card you learn a little Norwegian too! Gus is so proud of his greenhouse and he keeps it spick and span both inside and out and he is especially proud of his hanging baskets. 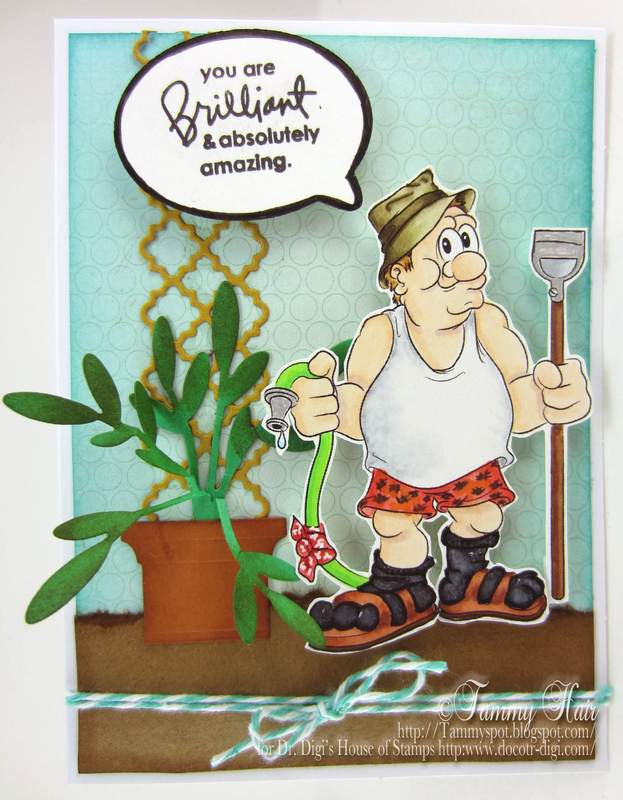 This year, he is hoping for a bumper crop of onions - the old fashioned variety. Gardening Gus could be visiting a garden near you for the rock bottom price of £1! If you want to know more about the greenhouse, pop over to my blog! Prof. Dummkopf looking rather dapper in his new blue jumper. with you lot over the next few weeks, as we're sure you'll love them just as much as we did. 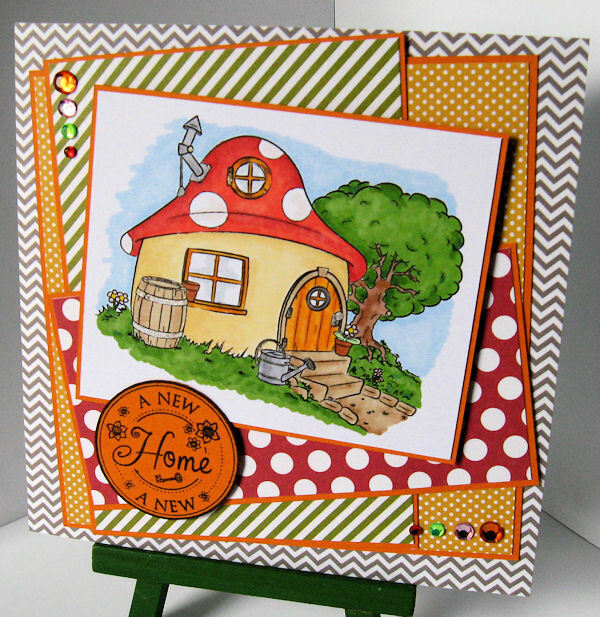 Today is Saucer Head Friday, you now have a choice, you can grab the nearest saucer and walk round all day with it balanced on your head or you can pop straight over to Dr Digi's House of Stamps and buy this cute Saucer Head! 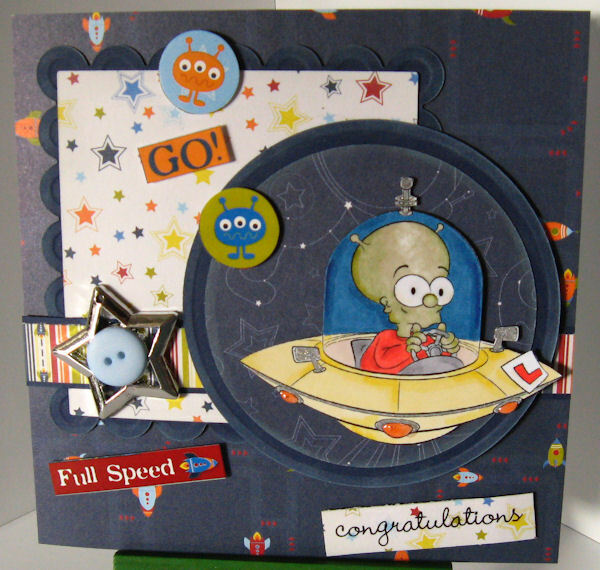 I must admit I am beginning to wonder if any of my sons will ever take their driving test, quite possibly we will all be zipping round in little flying saucers by the time they do! Clearly Mum is way too good a chauffeur! Yes you know how much Dr. D likes to dish out spot prizes for all you loyal crafters. Well today is the 200th Facebook like, and if that aint' worth a prize i dont know what is. had a chance to hand out our 200th, we got a new add and that just wouldn't be fair. 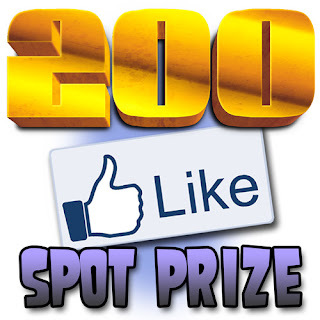 So Kay Louise Priest is getting a spot prize too for being our 201st like. Hey the Dr. sure is a nice guy. Dr Digi is kindly sponsoring the current Fetch A Sketch challenge - feel free to join in, especially as you could win a digi of your choice from the store! I've used the pipe digi and it could be yours for only 50p! If you want more details on how I've made it - have a look at my blog! 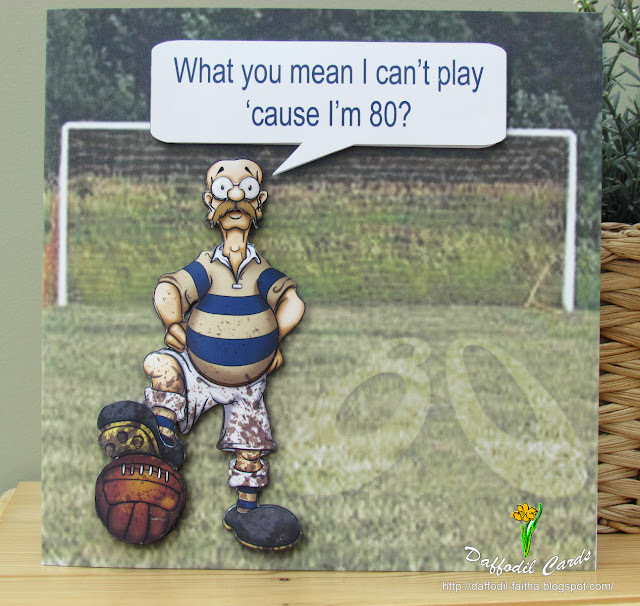 Faith A Sent in this great card using the pre-coloured version of "Dunderton Academicals FC." Proving that even decoupagers can have fun with digi designs. 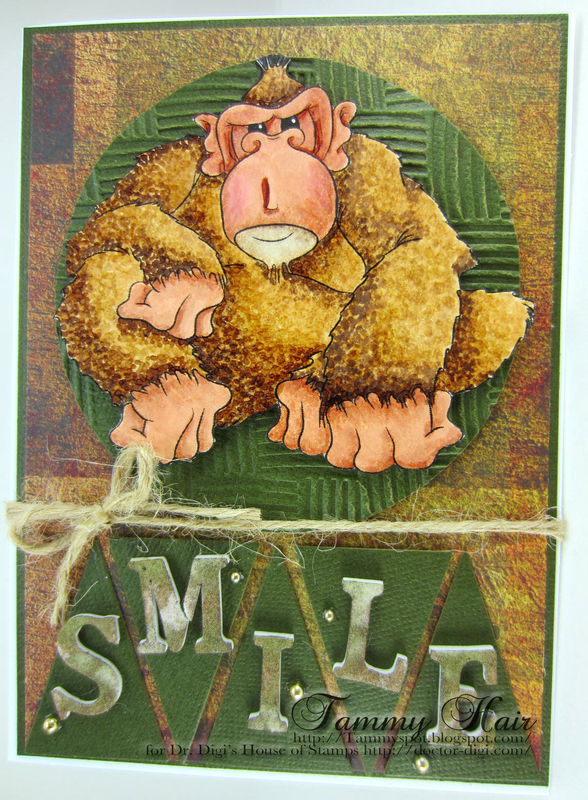 Crafting When We Can challenge has given Susan a little magic in her card making. Melvin the Magnificent's prestidigitation, and who can blame her? 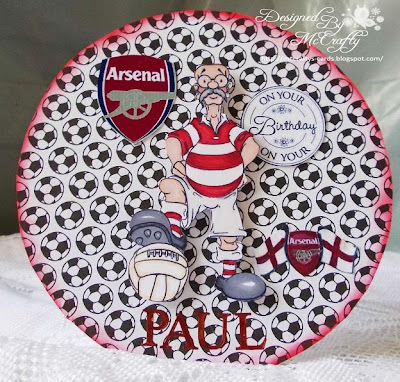 Mari over at One Stop Craft Challenge made a great card using Dunderton Academicals FC. 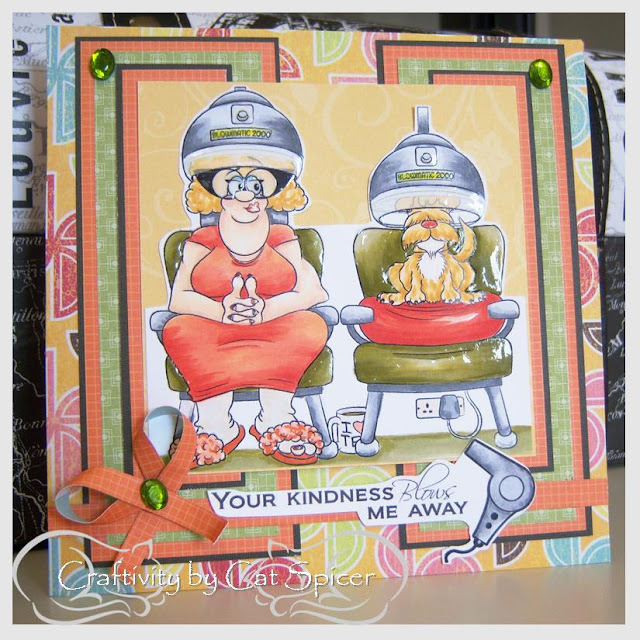 card using Salon Deirdrey . 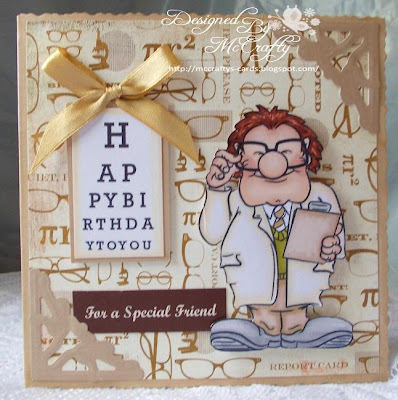 Before Prof Dummkopf became Famous for his fabulous inventions, He worked at his local opticians, doing the eye tests and prescribing the glasses, he dreamed of becoming a great inventor and would day dream while working, needless to say this job did not last long, you can find the prof in the store also check out his invention Mastermind, both are available instore now Dr. Digi's House of Stamps. Knitty Nora, who once was the Knitting Champion of Kendal in 1953, is still very active in knitting circles and regularly donates all her finished items to a refuge for abandoned animals. These sad and neglected animals find great comfort in Nora's misshapen knits and her weird and wonderful colour combinations are most welcome to the chameleons. So here is a snapshop of Nora in action, proudly displaying the Champion of Kendal 1953 trophy. You too can have your very own Knitty Nora (with or without sparkly pink fluffly slippers) as she is available to buy right now. And to finish the scene, the trophy and coffee table have been added. 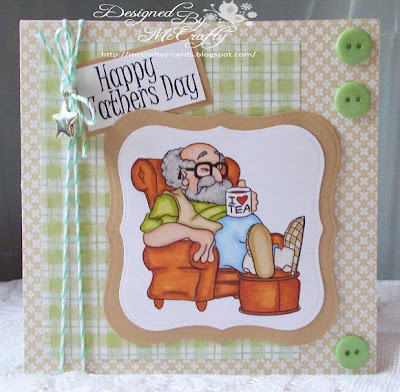 Stella Hughes has made a fantastic birthday card with "Man About The House"
I bet that Dennis was over the moon when he saw it. 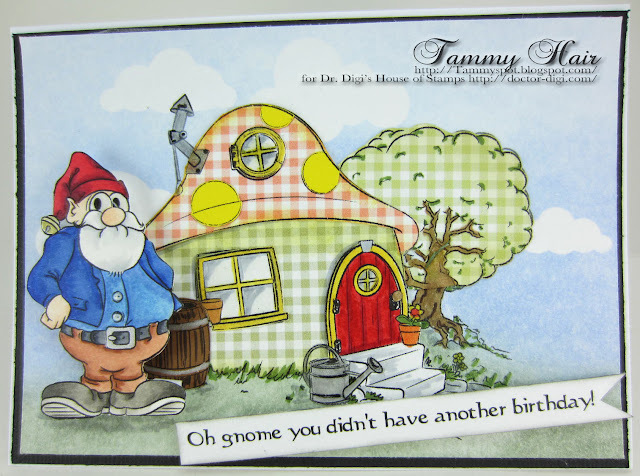 Look who stepped out of the world of Dr. Digi's House of Stamps and is waiting to greet you at the front door of his Gnome Sweet Gnome, it's Grimble Grumble! He heard you were going to be in the neighborhood so he decided to host a celebration. His friends are waiting inside to meet you, you'll find them close to the table filled with their favorite root vegetables and mouth-watering punch made from tasty red berries! Hope you enjoy your visit but don't stay too long because the band is really loud and there's not much room to dance! 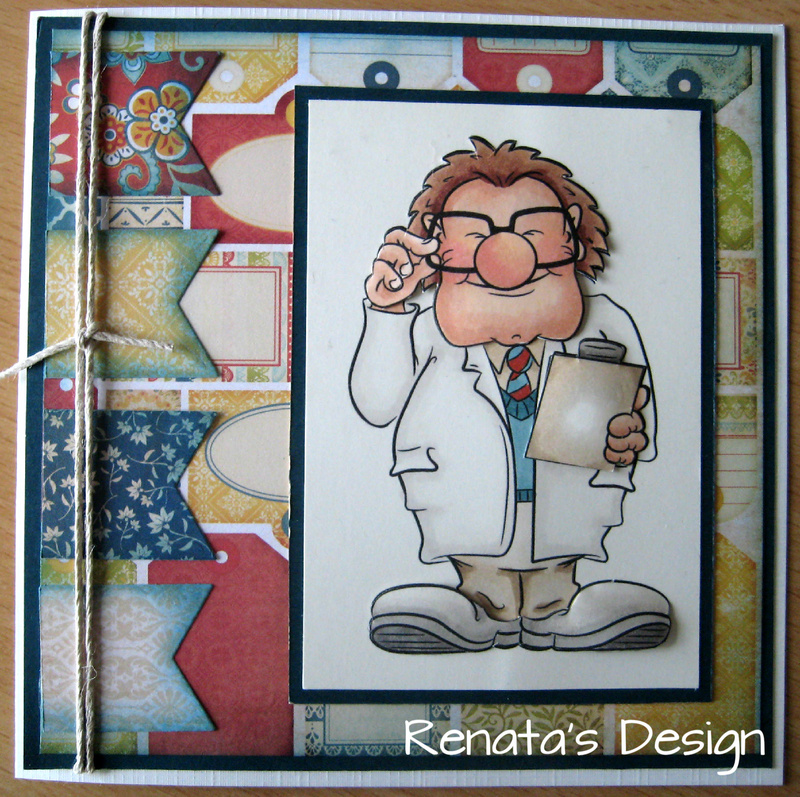 Tiz also my last post for Doctor Digi’s House of Stamps (sniff!). 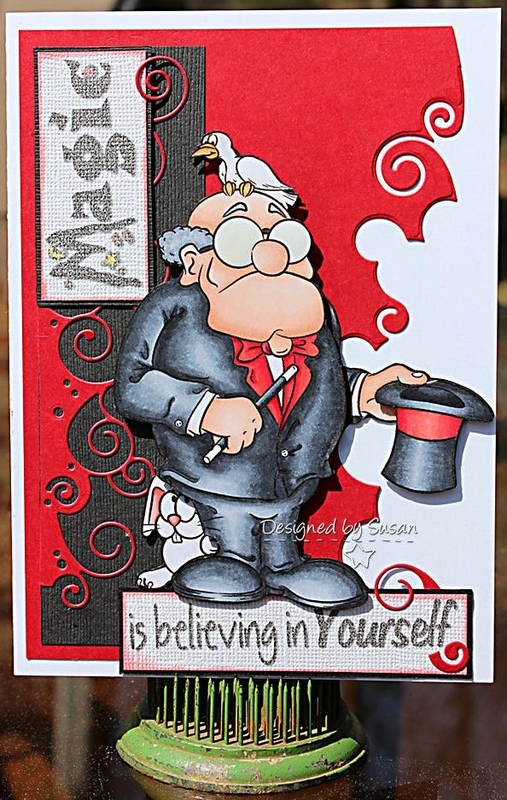 So for my final card for the Doc’ I’ve used the fabulous Tin Man with a message for us all. Now…the weekend’s here….pleeeeeeeze can we have some spring warmth!!! What ever you’re up to, have a great one. I think at the moment, in the UK, many of us are very fond of our Gnome Sweet Gnomes because it's so ridiculously cold outside still!! I know my gnome is very snuggly warm and outside isn't! If I could get away with it I think I would like my roof to be red with white spots, that would certainly brighten up the neighbourhood! 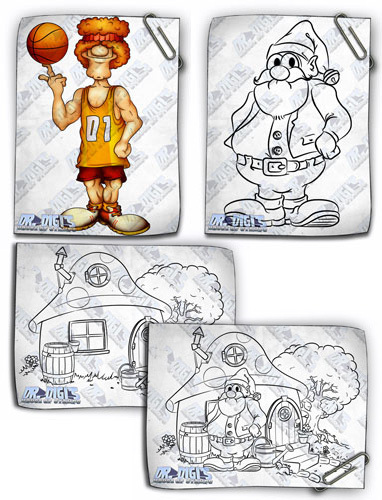 Go HERE to pick up your Gnome Sweet Gnome and check out the other new images, you could add a gnome to your gnome!! for I Love Promarkers. Now eyes front and ready for inspection. Good Morning All, This is Dunderton Accademical's Fc, and this guy has been playing for them for many years now, his dream has always been to play for Arsenal, but every time the scouts have visited Dunderton Accademical's he has been on the bench, but today is his Birthday and he has been promised a game, so he is very happy and hoping his dream will finally come true. you can find him hanging out in the Dr Digi's store. All is well. Dave is rather proud of his brand new shiny and squeaky clean kitchen. It is not quite to his taste, however Dave does not look a gift horse in the mouth especially when it is a free kitchen. He has been enjoying a lucky streak on the bingo down at the Legion on a Friday night and this is one of his winnings. Flip Flop Fred who calls the numbers (down at the Legion on a Friday bingo night) said he knows a mate who knows this bloke's uncle's sister's boyfriend who works at B&Q. And he got it cheap. So that was the prize a week last Friday. And Dave is happy he can wash his dishes until they sparkle and shine when ever he likes. All is well. To purchase your very own Dishcloth Dave head on over to Dr Digi's House of Stamps. Dishcloth Dave is unfortunately not free (like the kitchen) but for a nominal fee of £1 he can be your Dishcloth Diva. Well just look at the goodies the Doctor has for you this time.